WILLIAMSPORT, Pa. – The only three-time All-American in the history of the Lycoming College football program, Rick Bealer '91 has been selected to the third induction class of the Middle Atlantic Conference Hall of Fame, the conference office in Annville, Pa.
"It's a great honor to be inducted into any hall of fame," Bealer said. "To be inducted into this hall of fame for the MAC, it is a pretty high honor. To be included in the same group as Coach G (Frank Girardi, who was inducted in 2012), it's great for me to be involved in something like that." A 6-2, 196-pound defensive back, Bealer terrorized Lycoming's opponents for four years. More than 20 years after he last walked off the field, Bealer still holds the Division III record with 58 punt returns in 1989. He posted 566 yards on those returns, an average of 9.8 per return. As impressively, his 28 regular-season interceptions are still third in NCAA Division III history, and if his three career postseason picks are included, he has 31 picks, the second-most in Division III annals. "The guy was a truly special, special player," Giradi, who coached the football team from 1972-2007, said. "His numbers speak for themselves. He was just a winner in every sense of the word. He was one of those kids who you could use in different situations. He was a great punt returner. We always put him on the best receiver. In the Hofstra game (1990 national semifinals), we moved him to safety because we needed him there. He was a big-play guy. He is certainly one of the finest football players we have had here and very deserving of this honor." The West Point, Pa., native and North Penn High School graduate posted a school-record nine picks as a sophomore to earn Second Team Pizza Hut All-American honors. During that season, he also broke up 14 passes and tied a school-record with three picks at Albright, a mark he tied again the next year against the Lions. 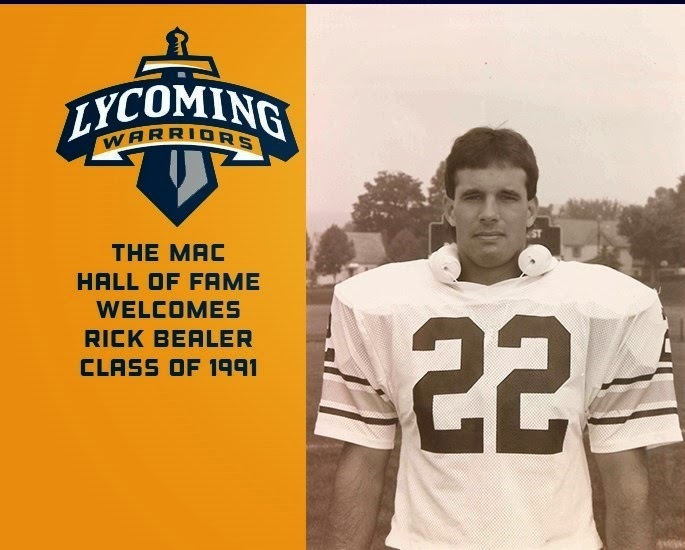 "He was an amazing player," Lycoming head football coach Mike Clark '93, who played with Bealer for two seasons, said. "He was a phenomenal athlete with great size that just made it really hard to throw the ball anywhere near him. He's in the top two or three in Division III in interceptions – I don't care what level you play at – that's a ridiculous number. He was really unique with his skill set." He posted nine more as a junior to earn consensus All-American honors, being placed on the Associated Press Little All-American, Kodak Small College and Pizza Hut First Teams while helping the Warriors to the NCAA Division III playoffs for the first time since 1985. He also earned the school's Sol "Woody" Wolfe Award after the season. As a senior, he posted eight picks while helping the Warriors reach the NCAA Division III finals, as he earned consensus All-American honors for a second time, earning slots on the AP Little All-American and Kodak Small College First Team and Pizza Hut Second Team. "He was an outstanding athlete," Lycoming's 40th-year assistant head football coach and defensive coordinator Steve Wiser '74 said. "He could have played at a couple different levels. (Former recruiting coordinator) Robb Curry did a great job recruiting him. He quietly did his job. He was the package – the run support, the coverage, and he was a guy who could make an impact with his interceptions changing momentum and turning into scores." In addition to the national honors, Bealer was a three-time First Team All-MAC selection (1988-90) and also earned honorable mention All-MAC honors as a freshman (1987). One of his five picks as a freshman included a 94-yard interception return for a touchdown at Moravian, setting a school record that stood for 16 years. During his career, he helped the Warriors to a 35-8-1 (.807) record, which included 12 shutouts and two MAC titles. Bealer is the only player in school history to lead the team in interceptions in all four years of his career and his 247 tackles are still seventh in school history, while his 184 unassisted stops are second. In addition to the 30 interceptions, Bealer also broke up 29 passes, the fourth-best mark in the school's annals. Bealer was elected into the Lycoming College Athletics Hall of Fame in 2001. He is the fourth Warrior to earn induction into the MAC Hall of Fame, joining longtime coaches Frank Girardi (football) and Budd Whitehill (wrestling), who were a part of the inaugural class in 2012, and Bill Bachardy '67 (wrestling), the school's only Division I All-American, who was inducted in 2013. Today, Bealer owns his own landscape and design company in Harleysville, Pa., and also coaches youth sports for both boys and girls.